Thanks for measuring the carburetor. A tachometer with a dial and pointer would probably work better than a digital one, I think I have read that on here before. I guess you replaced the points lately, you said on page 1 of this post. The point gap is important, but so is the 2 point surfaces. The surfaces need to be flat and shiny metal. The contacts in the distributor cap, and the rotor, should be clean and not burned. The spark plugs need to be clean and have the right gap to fire right, sometimes a spark plug can be bad and not fire well. The spark plug wires need to be good, sometimes one or more won't work right, making the engine misfire. all 4 plugs are new, i suppose one could be bad, but last time we had this operating seems like was doing the same thing. prob no way to find a bad plug wire? esp if it isnt consistent. yes points,cap,rotor were new,not the coil inside with them though thats about yr old . i did notice when rechecking gap on them one seemed to look a little raised/roughish where it contacted, not 100% shiny like it was new, not sure how to describe this didnt look terrible but not shiny smooth. wouldnt this be normal from use? OK, tks. As for the plugs and wires, you might try removing the wires from the plugs, one at a time with the engine running and see if the the plug is firing. If you find a misfire, you might be able to might be able to swap the plug wires around if they are long enough to see if it is the plug or the wire. Points can be removed and dressed with a file to restore the surface. The more contact surface, the better. If they are pitted or rough, it reduces the contact surface area. Clean them well and gap to .020, The condenser might also be a problem, not an easy way to check it. pulled wires one at a time from cap while running and have good spark, also pulled one at a time at the spark plug noise sounds the same for all. would you think the coil or condensor could be acting up even though sparking real good at cap? can you think of any other trouble shooting i could do? Tractors Owned: 1948 Cub, Kittie; 1948 Cub, Harold; 1949 Cub, 49er; 1951 Cub, Tucker; 1951 Cub, Homely; 1956 Cub High Crop; 1957 Cub Loboy; 57 Cub Loboy w/fasthitch + 194 plow; 1958 Cub LoBoy w/FH, Popeye; 1961 Cub, Beater; #1-1962 Cub Loboy Dually (Originally Orange) w/Foot Throttle; #2-1962 Cub Loboy Dually (Originally Orange) w/Foot throttle; Yellow 1963 Cub Loboy and blade; 1970 Cub, Cubbie; and 5 other Cubs in various stages of disaasembly and disrepair; 1962 Cub Cadet Original; 2 other Cub Cadet Originals; Cub Cadet 100; Cub Cadet 124 w/Creeper; Cub Cadet 147; 2 Cub Cadet 129's; Cub Cadet 149; 1948 Allis Chalmers C w/single frontwheel; 1944 Formal H w/Tokhiem Cab; 2 One Point Fasthitch Carriers; #100 Fasthitch Rear Blade; 2 Sets Cub 144 Cultivators; 2 Sets Cub 252 Cultivators; 3 Cub 193 Mouldboard Plows; 1 Cub 193 Slatted Plow; 1 1948 Cub-54 Snow Plow; 3 Cub-54 49-5 Snow Plows; Cub #6 Tool Bar w/Disc Blades & Middlebuster. Check to be sure you have copper core spark plug wires. Not carbon core. What spark plugs do you have? Brand and number? Cubfriend wrote: Check to be sure you have copper core spark plug wires. Not carbon core. What spark plugs do you have? Brand and number? Champion D21 or equivalent spark plugs. i figured i would have got comments that it was to hot already seems like long time ago it had d12?ish and the had some problems and the napa guy bumped us up to d14 or d15 cant remember now. seems like 14 but could never find them so went to 15.
anyway will give it a go. spark wires looked steel color, so looks like im good there its battery ign. The clutch pedal free play should be set to 1", measured at the surface where your foot sets on the pedal, not sure if you set that when you were done adjusting the clutch. 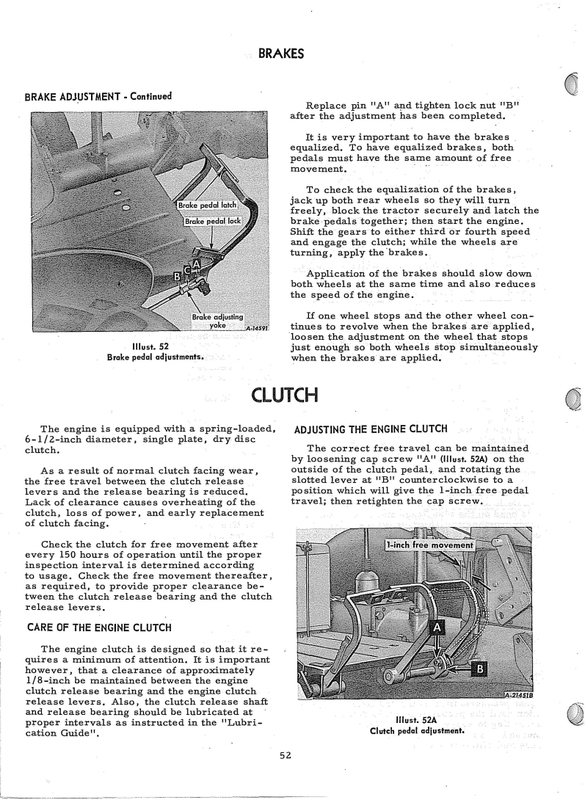 Below is a page from the 1975 Cub owner's manual showing it. yeah i read that glen, i guess i've never really understood that, with a fixed bar attached to the throw out bearing and needing 1/8" clearance for that isnt that (b) in pic how you attain that movement?at least thats how i have. i guess my point is how can i use that to get right clearance there and still be able to adjust free play in pedal? Tractors Owned: 48 Farmall Cub "Seen Yore Dobbin"
we did take apart carb again and cleaned, seems to be working alot better and runs without choke. everything is back together now, still have a few things to work out yet. something is definitely up with timing i believe, sitting there runs great throughout throttle, then after runnning quite awhile it will stumble a touch then smooth out, also on some test runs i put on the woods belly mower and it spits and stumbles more if you get into thick weeds something needs to be addressed . will have to look into getting a timing light and try those directions. i did 2 other test runs 1 each after turning distributer 1/8" or so both ways one way was way worse the other about same so i put it back . tried to get air out of hydraulics alot, i think lever is loose some. need to get all this wrapped up to get working on tierod issues. Good clean fuel tank and fuel go far. Filling tank after tractor cools at end of use can help cut back on condensation in tank. Water is not as bad running engine as it is running engine under load. A mowing deck can be finish or brush hog type. Sharp(!) Blades on the finish matter. The deliberate dull edge on brush hog blades means thinner deck width slices if bogging happens. Mowing high grass ( and tougher weeds more so) with a slow p.t.o. speed means when bogging is an issue ,thinner slices with raised deck to reduce height by multiple cuttings is called for. When cutting gets boggy I raise throttle speed and mow with front of deck raised and take thinner/ narrower mowing paths and run in first gear. At the risk of not going back and reading the entire thread, has the carburetor been off? If so, was the governor control rod adjusted afterward? Last edited by skindaddy on Sun Jul 30, 2017 11:54 am, edited 1 time in total.